Kegs at Greenbrier Valley Brewing Co.
Breweries in West Virginia produce some of the best beers brewed in the eastern United States. Breweries here often choose to brew craft beers inspired by the state’s awe-inspiring landscapes and by its history or fame as an outdoor-recreation destination. Most West Virginia breweries provide beer to local shops, bars, and restaurants. Some offer tasting rooms that may be rented out for group events. West Virginia breweries seem to be increasing in number exponentially. 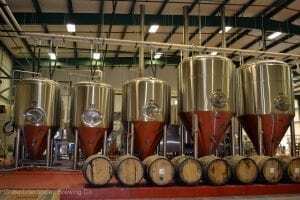 If you know of a brewery that’s not listed on our pages or have a suggestion for an article regarding West Virginia beers and brews, please let us know.